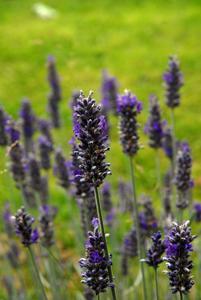 Some believe lavender oil heals skin cancer. If you've been diagnosed with skin cancer or know someone who has, you may wonder if there is a natural skin cancer treatment that could help. Many people believe that nearly any illness can be remedied through natural or alternative methods. The treatments discussed here have purportedly helped individuals suffering with skin cancer. It should be noted, though, that any and all advice or treatment for a serious medical condition should be discussed with your doctor or dermatologist. Below are some natural remedies for skin cancer. Natural treatments for this medical condition have been developed through trial and error. In most cases, they do not have scientific backing by the medical community. You may want to try these treatments in combination with medical care. It should come as no surprise that many people (and even some medical professionals) believe that eating a healthy diet can help guard you against potentially life threatening illnesses, including skin cancer. The vitamins and minerals in the foods we consume can be quite healing and can work with the body's natural systems to protect and regenerate cells. Here are a few tips to ensure that your diet is providing you with these important vitamins and minerals. Drink plenty of water. Staying hydrated is one of the most important aspects of being healthy. Consume a variety of vegetables daily, specifically sea vegetables, such as kelp, as well as cabbage, tomatoes, onions, hot peppers, soy, rosemary, and citrus fruits, like oranges and limes. Eat foods high in omega fatty acids. Examples of these kinds of foods include extra virgin olive oil, fatty fish, such as salmon, and nuts. Avoid certain oils, including safflower, corn, sunflower, and hydrogenated oils. There are some home remedies that involve applying oils or creams directly to affected areas or sometimes as drops in bathwater. Lavender and Chamomile Essential Oils - Place drops of these oils into bathwater and soak for 30 minutes. Orange Peel Oil - The oil includes D-limonene, which some believe is responsible for the lower risks of cancer and heart disease associated with the Mediterranean diet. Apply topically to the affected areas. It has long been believed by practitioners of alternative medicines that supplements can aid medical conditions. Here are a few supplements to consider adding to your natural skin cancer treatment regimen. A licensed herbal practitioner can often be found working at acupuncture clinics. These individuals may be able to prescribe you various herbs that can help treat the condition or perhaps alleviate some symptoms. Below are a few herbs that have been used to treat skin cancer. Additionally, some evidence suggests that acupuncture can help alleviate some of the symptoms of skin cancer, though not necessarily the condition itself. Many people believe that acupuncture can help to balance the entire body with the mind and the soul. Though it is understandable that an individual would want to forgo more invasive medical procedures in lieu of natural therapies, skin cancer can become life threatening. It's important to note that there are many different medical options available. People suffering with skin cancer should consult a medical professional about all of their options. It's especially important to make sure that natural remedies and treatments won't interact with and lower the efficacy of any current medical treatments.